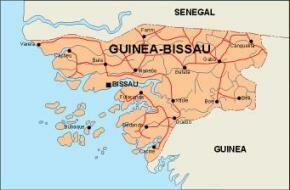 The Republic of Guinea-Bissau is a country in West Africa. 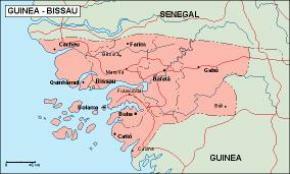 It is bordered by Senegal to the north, and Guinea to the south and east, with the Atlantic Ocean to its west. 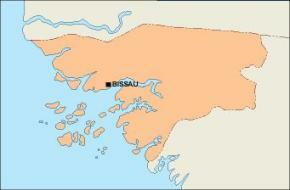 It covers 36,125 km² with an estimated population of 1,600,000. At 36,125 square kilometres. 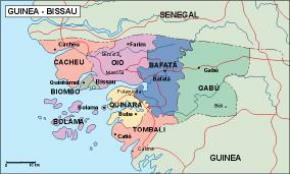 This small, tropical country lies at a low altitude; its highest point is 300 metres. 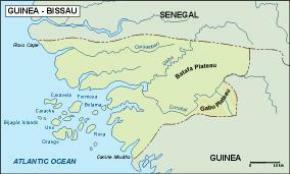 The interior is savanna, and the coastline is plain with swamps of Guinean mangroves. Its monsoon-like rainy season alternates with periods of hot, dry harmattan winds blowing from the Sahara. The Bijagos Archipelago extends out to sea.